Pyeongchang (South Korea) (AFP) - US journalist Katie Couric said she was "on thin ice" and apologised on Tuesday after she was relentlessly mocked for claiming Dutch success at the Olympics was because skating is an "important mode of transport" in the Netherlands. 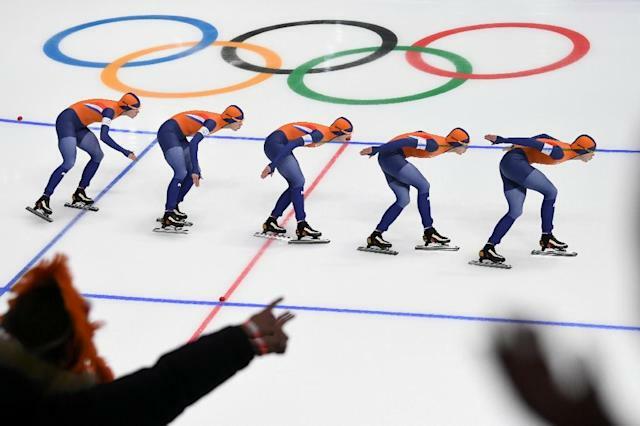 Hot on the heels of their stunning medals triumph in Sochi in 2014, the Dutch men and women speed skaters are already notching up major victories at the Pyeongchang Winter Olympics. During Friday's opening ceremony, as the Dutch team entered the stadium, Couric pondered to her audience of millions watching NBC television in the United States: "Why are they so good, you may be asking yourselves? "Because skating is an important mode of transportation in a city like Amsterdam. Amsterdam "has lots of canals that can freeze in winter. So for as long as the canals have existed the Dutch have skated on them to get from place to place to race each other and to have fun", the veteran broadcaster added innocently. But her comments sparked a Twitter backlash with people poking fun at her stereotypical views of the modern-day Netherlands, where temperatures now rarely fall below freezing. Couric -- by now well aware of the furore -- was contrite, writing on Twitter: "Congrats Netherlands on your (medal) count so far! My apologies for being on thin ice for my comments re: skating on canals." She added: "I was trying to salute your historical passion for the sport but it didn't come out that way! I'd (love) to visit again & celebrate your success!" Responding in kind, the Dutch embassy in the United States replied: "Hi Katie Couric, please come visit the Netherlands. "We'd love to show you all the innovative ways the Dutch get around, & are building the future of transportation. Of course, we can also visit our famous skating rinks. But the 61-year-old Couric, described on her own podcast as "journalism's most insightful interviewer", is unlikely to be allowed to forget the hullaballoo any time soon. Her original comments were first highlighted by Jos Duijvestein, who describes himself on Twitter as a Dutchman living in Canada. He tweeted a link to the TV clip, saying "You just can't make this up." Twitter user Dirk Jan Moedt mockingly posted a photo of a crowd of speed skaters racing around a track by a windmill with the caption "Rush Hour in the Netherlands". NBC, the US Olympic broadcaster, also parted ways with commentator Joshua Cooper Ramo, who said during the opening ceremony coverage that Koreans saw former occupying power Japan as a "cultural and technological and economic example". "It was possible for him to do more with us here," an unnamed NBC spokesman told the Korea Times, after an outraged response in South Korea. "Now it is no longer possible."